This was made by my mom. As it was very tasty & crispy, we finished it off. I suddenly remembered of posting it in the blog. But only one piece was there to take a snap. Mix all the ingredients without water (except oil). Take out a small portion, add little water and knead to form a medium soft dough. Heat oil in a kadai. Make balls out of the dough, place it in a ribbon pakoda achu and press it firmly, in a circular motion, directly into the oil. Flip gently on both sides and take out when golden brown. Ensure medium heat of oil. Proceed with the remaining mixture. NOTE: You can use the above ratio if making small quantities. YUMMY. Love to have those now when it's covered with snow here everywhere. lovely and crispy ribbon pakoda. Perfect snack for this winter.. looks perfect. btwn Ribbon pakoda looks gorgeous.. Awesome snack..Looks so perfect and yummy!!! Lovely pakodas, very crispy & delicious. My fav snack, prefect for evening snacks..
Awww...my favorite favorite type of murukku...my paati used to make one anda full of this for me! hahahha..wish i can have it now! Perfect snack...look soo crispy and perfect. mmm, reminds me of the festivity and colors looks very crispy!!! luks crunchy and tasty...nowadays ur pics r too good.. 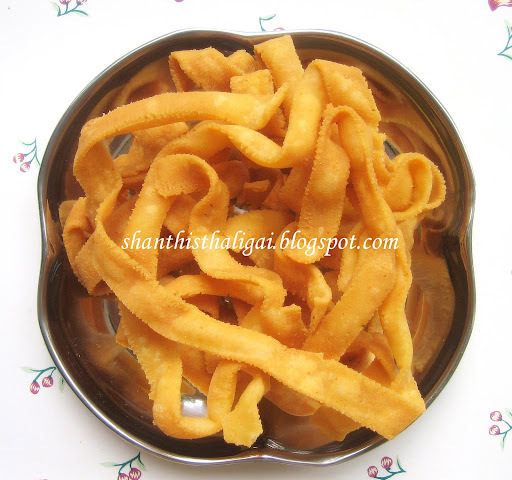 These and thaeththal are my fav Shanthi ji. Every time I come back from India, I get a big pack of these. Thanks for sharing the recipe! perfect tea time snack.so crunchy..loved d ribbon shape! looks too good. wish i could have some. I liked the name very much 'ribbon Pakoda'. And ofcourse it looks crunchy and tasty too. Paarththaalae nanna irukku. What lovely colour and this is called experience illya? ooh,crispy looking pakodas.my family's fav..When i am reading this post my daughter asked me to make for her ribbon pakkoda. Wow, I love them and lucky you that mom made it. BTW I announced my first event I thought I will let u know since u make such excellent stuff. Hi shanthi, iam back once again and those pakodas look lovely!! Excellent stuff, romba nanna vandhudu. I wanted to make manangombu but forgot to get payathamavu, so, made manangombu also with the same base, it came out really good.